An excellent tool to keep your body and your mind active. 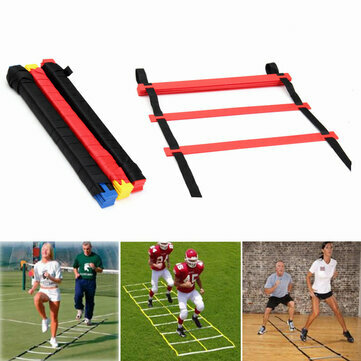 This agility ladder will bring you perfect workouts like hopping, in-out shuffle, back and forth jump, and zig-zag run to increase your speed and agility. Training with agility ladder also improve your memory and concentration as it simultaneously stimulates many parts of your brain working together while you are practicing for more effectiveness. Constructed with heavy-duty plastic rungs and durable nylon straps, the agility ladder is suitable for any high-intensity training. Specially designed to bring the flexibility for users, so you can adjust the distance from rung to rung to fit your purpose of training. Come with a stuff sack for easy packing and traveling. Compact, lightweight, and portable. good product but not finish on the end.